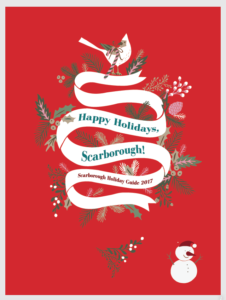 Welcome to the 2017 HOLIDAY GUIDE for Scarborough, brought to you by the Scarborough Community Chamber of Commerce, SEDCO and Scarborough Buy Local. The Guide is in a PDFs format and meant to be updated. If you would like to include your holiday events, specials, discounts or gift ideas in the Scarborough guide, please send your information and photos to research@sedcomaine.com. There is no cost to participate and the guide is available to view on the SEDCO, Scarborough Community Chamber of Commerce and Buy Local websites. We will also be promoting the guide in the Town’s newsletter so the residents can use it as resource throughout the holiday season.